Gerald Ford, Nixon's successor, appointed Bush to be Chief of the US Liaison Office in the People's Republic of China. Since the United States at the time maintained official relations with the Republic of China on Taiwan and not the People's Republic of China, the Liaison Office did not have the official status of an embassy and Bush did not formally hold the position of "ambassador", though he unofficially acted as one. The time that he spent in China — 14 months — was seen as largely beneficial for US-Chinese relations. After Ford's accession to the presidency, Bush was under serious consideration for being nominated as Vice President. Senator Barry Goldwater of Arizona declined to be considered and endorsed Bush, who, along with his supporters, reportedly mounted an internal campaign to get a nomination. Ford eventually narrowed his list to Nelson Rockefeller and Bush. However, White House Chief of Staff Donald Rumsfeld reportedly preferred Rockefeller over Bush. Rockefeller was finally named and confirmed. Bush stepped down as head of the RNC after Gerald Ford became President. The new President appointed Bush as the U.S. envoy to the People's Republic of China. Because the United States did not yet have full diplomatic relations with China, Bush served as chief of the U.S. Liaison's Office instead of as ambassador. China offered the Bushes a respite from Washington, but they stayed only two years. 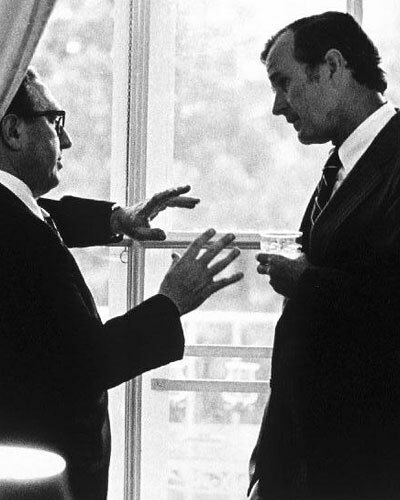 They returned to the United States in 1975 when President Ford asked Bush to serve as the new director of the Central Intelligence Agency (CIA). The CIA was emerging from a controversial period in its history and needed a strong, effective leader to improve morale and reform the agency. By most accounts, Bush was a popular director and able administrator. After Ford lost the 1976 presidential election to Jimmy Carter, Bush offered to stay on as director of the CIA but Carter declined his offer. The Bushes left Washington, D.C., and returned to Houston. George Herbert Walker Bush — like Gerald Ford — is a former congressman, vice president and president. He was appointed by President Ford to the directorship of the Central Intelligence Agency (CIA) and as Chief of the U.S. Liaison Office in the Peoples Republic of China. In l975, he coordinated President Ford's State visit to China. To mark Gerald Ford's 90th birthday, George H.W. Bush told me: "As soon as he became president, Gerald Ford restored honor and integrity to the White House, thus sending the nation a very reassuring signal about the presidency itself," former President Bush tells me. "He was a fine leader who understood the need of avoiding extremes as well as the need to bring people together. "From him, I learned so much, particularly about the complexities of the U.S. Congress. To this day, I treasure our friendship." August 24: Bush waits at Kennebunkport to find out who President Gerald Ford has chosen as vice president. Bush is the first choice among party leaders. Ford calls Bush just before walking out to announce Nelson Rockefeller as his choice. A reporter with Bush in Kennebunkport says, "Mr. Bush, you don't seem to be too upset about this." Bush replies, "Yes, but you can't see what's on the inside."